No occasion is too small for this perfect culinary gift. 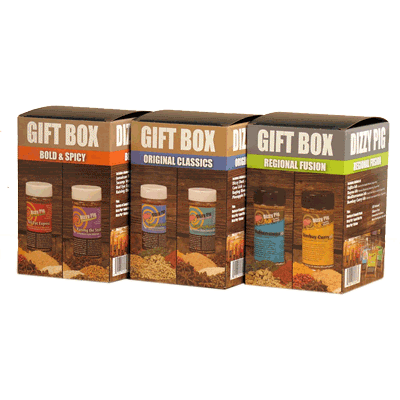 Nothing says “You love food and I love you” quite like a gift box full of delicious spices. Now your gift recipients can put a delectable rub on anything and everything they can think of, from chicken to pork, beef to fish, veggies to – heck – grilled fruit and dessert. Because why shouldn’t every course and every part of the food pyramid be as delicious as any other? We say, there’s no reason at all, and our gift boxes make culinary creativity more possible than ever before. Each collection includes four shaker bottles of dry rub, a variety of samples of our other flavors, a Dizzy Pig lapel pin and a sticker, all beautifully packaged in a colorful, eye-catching and sturdy box. Chuck it under your holiday tree, present it on a birthday, or give it to someone you love just cuz. As in “just cuz they rule” or “just cuz you like their cooking” or “just cuz you forgot that One Really Important Thing and now you’re in major trouble.” It’s an equal opportunity gift set, and you’ll find it does the trick just beautifully. Go for the Original Classics mix, which is the perfect introduction to our spice rub line. Or you can opt for the Bold & Spicy set, for those that love a burning tongue. Have a worldly cook? Select Regional Fusion, which collects flavors from all over the world. A perfect house warming gift, Father’s Day present or Thanksgiving contribution, this Gift Box will give back all year round! Please note, our Gift Box 4 is not customizable. For customization, see our Pick 4 and Pick 7 discounted multi-packs. Dizzy Dust, our original rub, perfect for everything and anything that goes on a grill! Cow Lick, our spicy beef rub, great on steaks and briskets, the perfect mix-in for meat loafs and burgers. It’s also our secret weapon when it comes to scrambled eggs and fresh tomato slices! Raging River, our maple sugar rub is ideal for salmon, but also terrific on ribs and pork shoulder. It’s a sweet rub that will transform your food! Pineapple Head, a sweet rub with a little heat, cinnamon and some earthy chilies and other savory notes. Our customers go gaga putting it on fruit, sweet potatoes, veggies, ham and even chicken and seafood. Plus, several samples of other Dizzy Pig products, a lapel pin and sticker. Jamaican Firewalk, based loosely on the island tradition of “jerk”, Jamaican Firewalk touts a hefty dose of ginger, habanero chilies, and Jamaican allspice berries. Swamp Venom, a deep South inspired concoction with influences from Georgia to Texas and is made for those that like a ton of flavor and a good spicy hot kick! Red Eye Express, a rich blend that offers a parade of flavors and aromas. An exciting blend of herbs and chiles is rounded out with the malty flavor of fresh ground coffee. A true work of art. Raising the Steaks, based loosely on the popular “Montreal Style” seasoning. Dizzy Pig’s Raising the Steaks turns the original on its head with fresh ground seasonings. Amazing on beef, but quite versatile. Fajita-ish, captures the south-of-the-border flavor profile perfectly! An all-natural, fresh approach that nullifies taco seasonings. Bayou-ish, the ultimate blackening seasoning, and it’s all you need for great flavor sizzling in a cast iron pan. Great for searing fish, seafood, chicken, ‘gator, beef, pork or veggies. Mediterranean-ish, captures the exotic and enticing aromas and flavors of Italy and Greece for your next cooking adventure. Bombay Curry-ish, is far from typical. This tasty curry-inspired blend is quite versatile and both bright and earthy. Whether you are a curry fan or not it’s delicious.